After the annulment of the June 12, 1993 election which is universally acclaimed to have been won by late Chief M.L.O Abiola, there were pressures by Civil Society and the International Community on the Ibrahim Badamosi Babangida led Military Junta to rescind its decision and declare Chief Abiola as the winner of the election. O’ our body politic, a concept hitherto unknown to our political lexicography, something strangely called the ‘annulment’ of an election perceived by all to have been the fairest, cleanest and most peaceful ever held in our nation. “Since that abominable act of Un.clad political armed robbery occurred, I have been constantly urged by people of goodwill, both in Nigeria and abroad, to put the matter back into the people’s hands and get them to actualise the mandate they gave me at the polls. “All we can see are the consequences of this permanent game of military “about turns;” high inflation, a huge budget deficit and an enormous foreign debt repayment burden, dying industries, high unemployment and a dem0ralised populace. This programme was aimed precisely at solving these economic (problems) that have dem0ralised us all. “To be precise, you gave me 58.4 per cent of the popular vote and a majority in 20 out of 30 states plus the Federal Capital Territory, Abuja. Not only that, you also enabled me to fulfil the constitutional requirement that the winner should obtain one-third of the votes in two-thirds of the states. 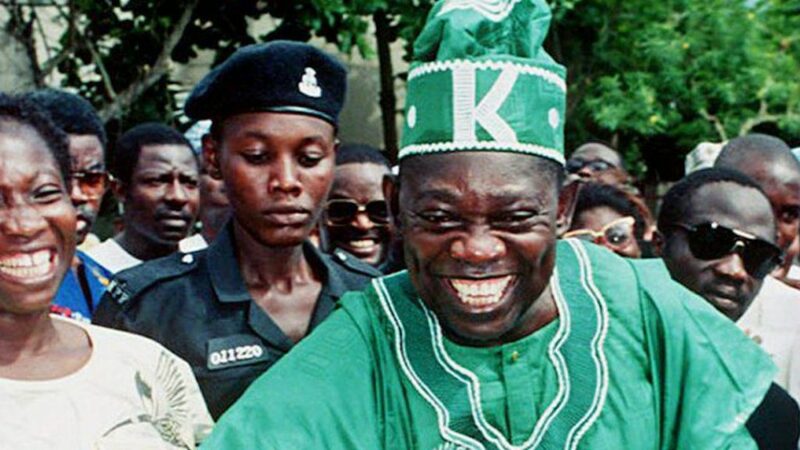 0 Response to "Here Is The Transcript Of The Speech MKO Abiola Made That Got Him Arrested"